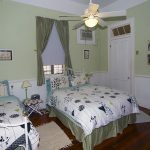 The Burgundy Bed and Breakfast is located in the historic Faubourg Marigny neighborhood of New Orleans. Our neighborhood has much to boast about. There are many restaurants and bars nearby, it is suitable for jogging and biking and the “Country Club” is nearby for swimming. 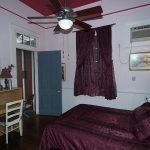 The Marigny-Bywater and the St. Claude bus stops are 2 blocks away, the Rampart-St.Claude streetcar and the Frenchman Street restaurants and clubs are a 10 minute walk away, and the French Quarter and the Riverfront streetcar stop are a 15 minute walk. To Jackson Square, the heart of the French Quarter, it’s a 20 – 25 minute walk. New Orleans is one of America’s Favorite Cities! Travel + Leisure Magazine announced that New Orleans placed number one in the overall categories of Nightlife as well as Food and Dining for their 2009 “America’s Favorite Cities Survey.” New Orleans also topped the charts in sub-categories as a favorite for Wild Weekends, Best Stylish Boutique Hotels, Cocktail Hour, Singles Bar Scene, Live Music Concerts and Bands, Antique and Vintage Shopping, Cafes/Coffee Bars, Neighborhood Joints and Best Spring Break Destination. Zagat recently named New Orleans the most affordable dining destination in the country, based on a survey of 375,000 diners from around the world. NEW ORLEANS – (July 7, 2016) – On what is deemed one of the luckiest days of the year (7/7), New Orleans is celebrating. The readers of the prominent travel magazine have named New Orleans the No. 7 City in the World. New Orleans was also named the No. 2 City in the United States for the third consecutive year. Readers ranked cities on their sights and landmarks, culture, cuisine, friendliness, shopping, and overall value. The designation as a World’s Best City is New Orleans’ most recent accomplishment in a string of accolades including Condé Nast Traveler’s list of Best Big Cities in the U.S., The Washington Post’s list of 10 Best Food Cities in America, Travel + Leisure’s list of America’s Favorite Cities and among others. More information on Travel + Leisure’s World’s Best Awards and a complete list of winners can be found at www.travelandleisure.com/worlds-best. 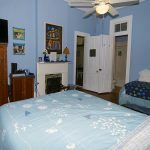 The American Planning Association designated the Faubourg Marigny one of 10 Great Neighborhoods for 2009 by APA’s Great Places in America program. Through Great Places in America, APA recognizes unique and authentic characteristics found in three essential components of all communities: streets, neighborhoods and public spaces. APA Great Placesoffer better choices for where and how people work and live every day, places that are enjoyable, safe and desirable. Such places are defined by many characteristics, including architectural features, accessibility, functionality and community involvement. From the east: Stay on I-10 until the Elysian Fields Av. Exit 237. Take Elysian Fields to the left (South) for approx. 1.1 miles. After crossing St. Claude Av. (traffic light), N. Rampart and Burgundy, take a left on Dauphine (traffic light) and continue for 5 blocks to Franklin Av. (traffic light). Take a left on Franklin (for one block), then left on Burgundy, and park in front of the house (on-street parking is free and reasonably easy and safe; there is no off-street parking). From the west (airport): From I-10 take I-610 East at Exit 230. Continue for 3 miles to Exit 3 (Elysian Fields Av.) Take Elysian Fields to the right (South) for approx. 1.8 miles. After crossing St. Claude Av. (traffic light), N. Rampart and Burgundy, take a left on Dauphine (traffic light) and continue for 5 blocks to Franklin Av. (traffic light). Take a left on Franklin (for one block), then left on Burgundy, and park in front of the house (on-street parking is reasonably easy and safe; there is no off-street parking). Alternative route from the west (airport): Stay on I-10 (this requires concentration!) until the N. Claiborne Exit 236B. Follow N. Claiborne for approx. 3 blocks to Elysian Fields (traffic light). Take Elysian Fields to the right (South) for approx. 0.6 mile. After crossing St. Claude Av. (traffic light), N. Rampart and Burgundy, take a left on Dauphine (traffic light) and continue for 5 blocks to Franklin Av. (traffic light). Take a left on Franklin (for one block), then left on Burgundy, and park in front of the house (on-street parking is reasonably easy and safe; there is no off-street parking). 1. Taxi: Charge is $36 for one or two persons, $15 per person for 3 or more). However, the driver is allowed to turn on his meter when he crosses Elysian Fields (only 4 blocks from the B&B, but there is also no rule that says he has to take that route!). 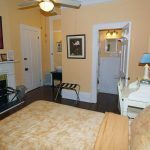 As a courtesy to the many B&B’s in the Marigny rectangle (so across Elysian Fields), United Cab does not charge B&B guests extra for crossing Elysian Fields. (If the driver doesn’t know about it and charges more, get his cab number and we’ll get a refund.) Here’s how this works: As soon as you have your bags, call United Cab, 504-522-9771. They get your name and location (in front of baggage claim of your airline) and give you the number of the cab which has been ordered. Walk out the nearest door, cross the first lanes of traffic to the neutral ground (median). The cab is there very fast; check that your name and his cab number match. 2. For a few dollars more ($38 for 1 or 2, $18 per person for 3 or more) Stanley Lane offers premium airport pickup service. You can arrange pickup by contacting him through his website, www.apt-transport.com. (Same as with United Cab, no extra charge for crossing Elysian Fields.) He will meet you at baggage claim and provide you with an enjoyable ride to the B&B. 3. Rental Car: Follow the signs to I-10 East New Orleans, then follow the driving directions above “From the west”. 4. The Airport Shuttle costs $20 per person one way. They most probably will not cross Elysian Fields Ave., so you will have to ask them to drop you off at the Elysian Fields Inn and then walk the last 4 blocks. In my opinion this is not the best option! 5. Public Transportation: During the day weekdays the Airport Express Bus E2 leaves the airport about every 30 minutes and costs $2 exact fare. It takes about 45 minutes to the Central Business District, Loyola and Tulane Ave (http://jeffersontransit.org). From there you transfer to the St. Claude bus (number 88, $1.25) to St. Roch Ave. (about 5 minutes), only 2 blocks from the B&B. At night and on weekends I would not recommend this option, as the Airport Express does not come all the way downtown. There is a second Airport Express Bus 202, which operates 7 days a week, leaving the airport at 2:10, 3:50, 5:00 and 7:00 p.m. for the CBD Elk Pl. and Canal St., taking 30 to 40 minutes and costing $1.50. (www.norta.com). 6. Uber/Lyft: Both Uber and Lyft operate in New Orleans. Just use your app to have them pick you up at the Transportation Center at the airport. Fare estimate $22-$33, but sometimes there is surge pricing. Last Minute Discount For bookings made within 2 days of your arrival date, a discount of 10% will be applied (on a maximum of 3 days) on the quoted rate during confirmation. Mention Last Minute in the Comments section of your reservation request.